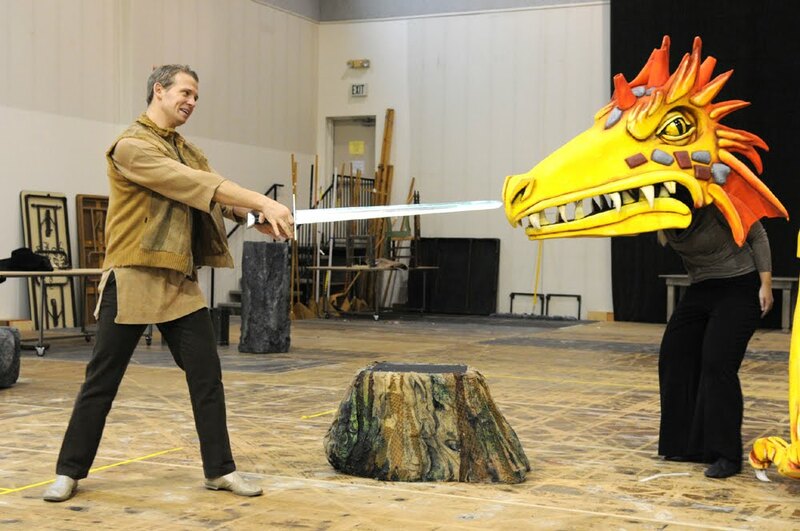 I stopped David Krohn, who is finishing up his second season as a Young Artist with Seattle Opera, on his way into a rehearsal of Prince Yamadori's scene recently. We spoke about climbing raked stages and mountains, about the wild outfit he wears in the show, and his favorite new mode of transportation. We think everyone in Seattle will soon be riding in a kago! It's almost time for your big scene in there! But before you have to head into the rehearsal studio, can you tell us a little about your costume? Yes, my understanding is that I’m going to be in a bald cap with a long queue, braided, and wrapped up on top of the head. Not down my back. The costume is really intricate , it’s a series of robes, with these giant shoulders. I expect to look like Shredder, from the Ninja Turtles. 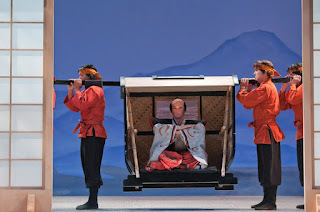 I understand that the kimonos for this production are a little more theatrical than authentic. Do you have an obi, the traditional sash around a kimono? Yes, there’s a sash, and my pants hook into that sash as well. And then, you have a bunch of sidekicks? Yes. Actually, they carry me onstage. The term we’ve been using is kago. I’m afraid I'm not too familiar with these traditions! [A palanquin has four poles, a kago only two.] Essentially it’s a chamber, with four attendants carrying it by poles on their shoulders, two on either end. It’s a challenge--I feel bad for them!--because the stage has a steep rake. From backstage they have to pick it up, climb up to the top of the rake, and then change directions and come down. What research have you done to play a nineteenth-century Japanese prince? I learned my music. 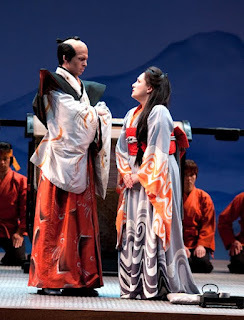 Actually, to research the role of a Japanese prince in an Italian opera by Puccini and Illica and Giacosa...I spent last summer in Italy, that was my research! Why does B’fly hate you so much? I think she hates the idea of anybody else trying to marry her. She considers herself a married woman. It's disrespectful of Goro to assume that her marriage doesn’t exist...that’s what she hates. You know, if you went up to a married woman on the street and said, “Hey, I’m gonna hook you up with my friend!” she probably wouldn’t like that. Sarah Larsen (Mercédès) and David Krohn (Dancaïre) in last fall's Carmen. 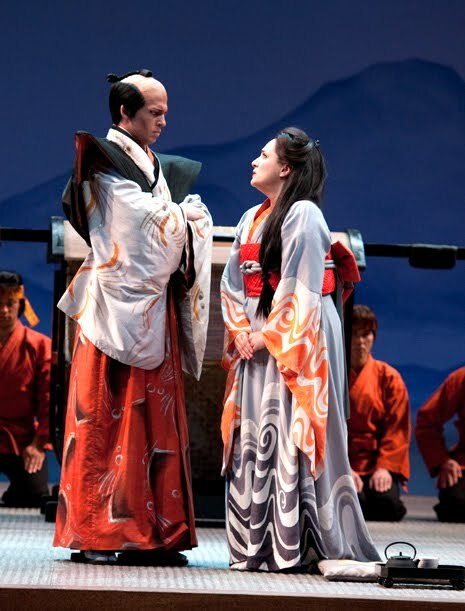 In Madama Butterfly, Larsen stars as Suzuki and Krohn is Prince Yamadori. Can you compare the challenges of a small role like this, where you’re on then off, to a role like the one you did last fall in Carmen, Dancaïre, where you have a lot of stage time but you’re generally not the focus? Dancaïre is maybe 40 times the amount of singing than Yamadori. The Yamadori scene is very brief, whereas if you add up all of Dancaïre, it’s probably about 15 minutes. 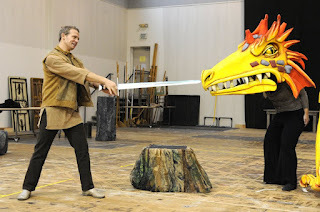 There’s the ensembles, the quintet, the interjections here and there...honestly, Yamadori is a very, very simple role. One last question: you’ve been here now two years. When do you climb Mt. Rainier? That’s the question, isn’t it! I have a lifetime goal of climbing all the mountains (in the contiguous U.S.) higher than 14,000 feet. Unfortunately the climbing season at Rainier is such that you have to be here in the summer months. Two summers ago I was in Aspen, singing, and last summer in Italy, so I couldn’t be here during the climbing season. And it won’t be this summer, either. People book these expeditions 18 months in advance. But I’m hoping to stick around, or come back the summer of 2013. For the Ring! Another great mountain to climb!